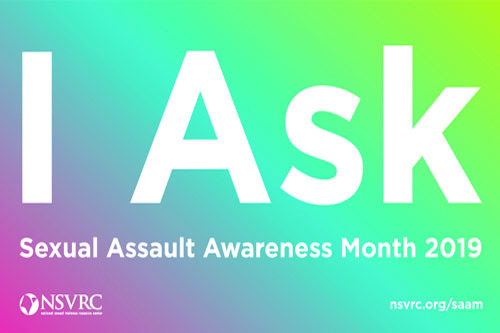 2019 Sexual Assault Awareness Month Theme is "I Ask"
Racers Rock will be painted teal, the color of sexual assault awareness and prevention. Campus members are encouraged to wear teal, whether it’s a teal ribbon, shirt, or other accessory that will serve as a conversation starter about topics like consent, healthy relationships, and supporting survivors. 90-minute workshop on relationship abuse that explores the difference between healthy and unhealthy relationships. Led by Erin Fitzpatrick, UNOH Student Success Coach, this workshop includes a 45-minute video screening and an open discussion that gives attendees a framework to talk about unhealthy relationship behaviors, ask questions, & learn about resources to stop relationship abuse. Drop by the SAAM booth and learn about the importance of asking for consent in online interactions. Learn more about sharing online, sexting, picture pressure and consent violations. Information will be available at the booth, along with giveaways, free snacks and tickets for the SAAM weekly raffle gift cards. Wear jeans all week long with a purpose. Support survivors and educate yourself and others about sexual assault. UNOH Faculty and Staff may pay $5 to wear jeans each day or $20 to wear jeans all week. Donations raised will be given to Lima community agencies serving survivors in our area, including Crime Victim Services, Mercy Health St. Rita’s and Lima Memorial Health System. UNOH will be hosting an “I Ask” Teal Color 3K & 5K Run/Walk in support of Sexual Assault Awareness. Throughout the marked course, participants will be doused with teal colored powder. Teal is the color of sexual assault awareness and prevention. The event is open to all community and campus members. The Teal Color Run is an untimed 3K or 5K event. All paid participants will receive a complimentary t-shirt at the event. All proceeds from this Color Run/Walk will be donated to Lima community agencies serving survivors in our area, including Crime Victim Services, Mercy Health St. Rita’s and Lima Memorial Health System.